If you are into crafting and making your own soap, you are probably familiar with using dry/powdered lye for soap making. 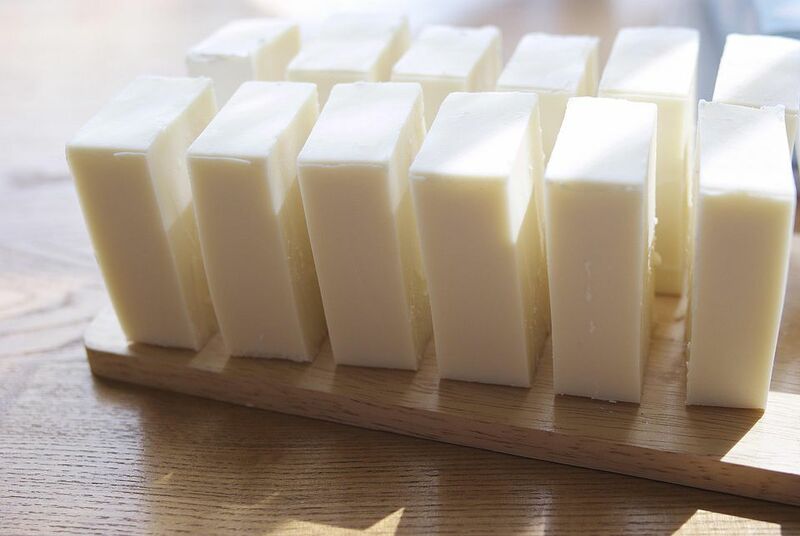 If you want to try something new or cannot find dry lye, consider the technique of using a liquid lye solution for making soap instead of making your own lye solution from scratch. It's not any more difficult than regular soapmaking and doesn't require any extra time. It will just need an adjustment to your procedures and some different materials. VERY IMPORTANT! Make sure that your lye solution is just sodium hydroxide and water and not ​a liquid drain cleaner with other ingredients. Know what the ratio of lye to water is. It should be stated clearly. For example, a 50% lye solution would indicate it's 50% water and 50% lye and indicate that its by weight. Once you've established the ingredients and ratio, use a lye calculator to figure out the right amount of lye for your recipe. NOTE: This is based on using a 50% lye solution. If your solution is different, you'll need to adjust. To adjust for your recipe, start with the amount of lye called for in your recipe and figure out how much solution that will take. In a 50% solution, it's easy to figure out. You will just double the weight of the lye and that will give you the right amount of solution. Once you've got the lye properly measured, bring the amount of water up to the total called for in your recipe. With the 5 oz./10 oz. example, add an extra 5 oz. of water to the 50:50 solution. So, instead of 5 oz. of lye and 10 oz. of water using dry lye, you would have 10 ounces of 50:50 solution and 5 oz. of water. Use the diluted lye solution as you would a freshly made pitcher of lye-water to make your soap. You can mix the pre-made solution and store it for later use. Just store it safely. Do NOT heat the lye liquid! If your room temperature is cold, you can use hot (NOT boiling) water as your "added water" to help bring the temperature up a bit. As long as your solution is somewhere between 80 to 100 degrees Fahrenheit, you should be fine. Lye-water solution looks just like water and can cause serious burns even more quickly than dry lye! Be extremely careful with it. Store it away safely. Consider it as dangerous as acid or gasoline. Be sure to weigh everything! Do not use liquid measures.